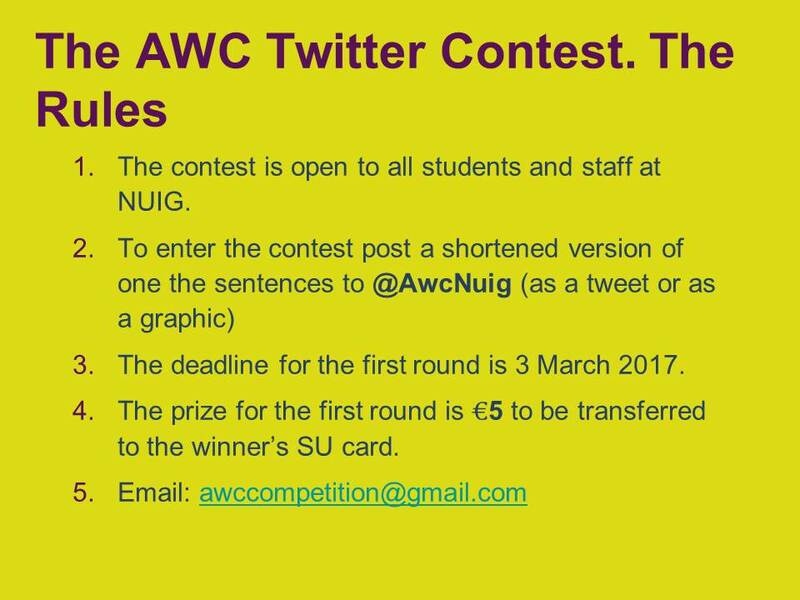 The AWC is proud to present our first twitter competition. 1. St. Patrick's Day is fortunately coming up, which is a holiday, and it is also sometimes called the Feast of Saint Patrick, which is the same Patrick that, having spent many years as a slave there , returned to Ireland and banished all its snakes, which is an interesting legend, as it is a comment on Christianity, and it is an explanation of Ireland’s absence of snakes, and it might also be a story in a sort of code about possible relations between the followers of the Church and their opponents, and it is held in March, the third month of the year, and this holiday involves eating and drinking, and even getting drunk, and it is a public holiday in the Republic of Ireland and also Northern Ireland which is where it is celebrated. One of the greatest perks of being an archivist is being the first to explore an archive for the first time. You get to look at long forgotten papers, photographs and publications that have not been looked at or thought about in a very long time by the creating organisation or individual. When you come upon a discovery that helps you better understand how the organisation worked, sheds more light on a certain subject or provides you with new evidence your excitement builds and you become engrossed in that file, letter or note. It takes a lot to pull yourself out of that discovery so that you can get to the next discovery in the collection. A wonderful discovery in the Muintir na Tíre collection is the number of publications Muintir na Tíre produced. I have discovered over 150 so far. 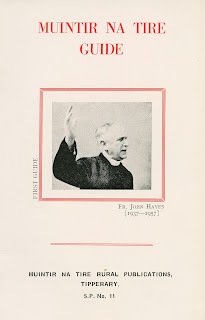 They published a great many publications relating to community development, sociology, Muintir na Tíre itself, improving rural Ireland and Canon Hayes. 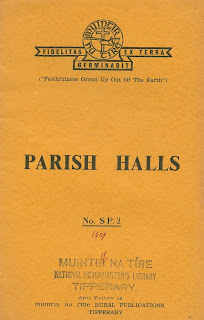 Their standard bearer publications were Landmark a monthly magazine published from 1944 – 1973 and Rural Ireland an annual published from 1941 to 1972. Both of these contain a wealth of information on Muintir na Tíre, guilds/community councils and on the many issues facing Ireland. A future blog will look at these in depth. 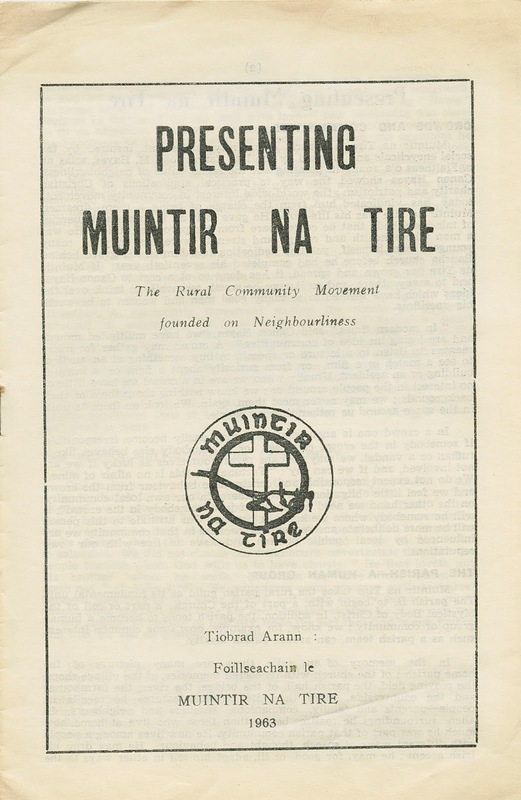 The other publications of booklets and information sheets that Muintir na Tíre published contain a wealth of information for the guilds/community councils and for the local communities. They published booklets focusing on issues on community development by leading authorities in their field. 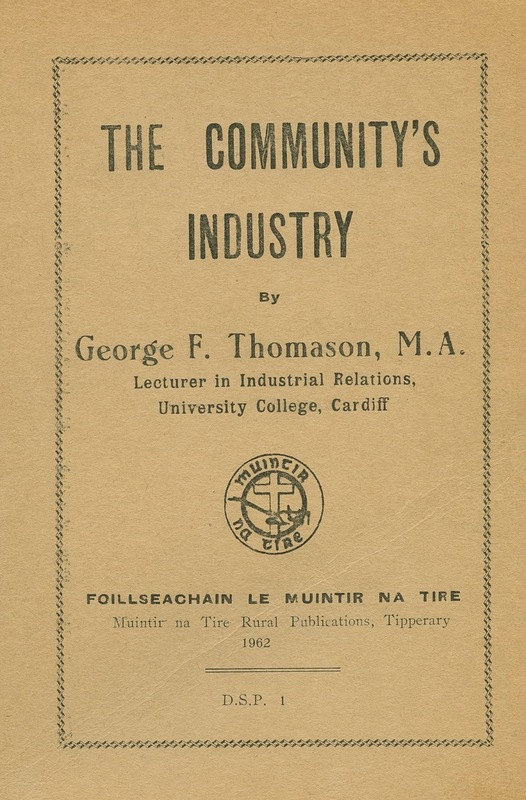 The Community’s Industry by George F. Thomason discusses how guilds can develop industry or entice industry to their community. 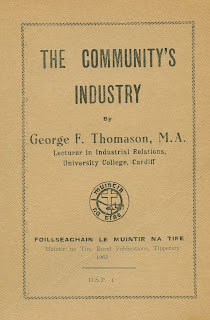 Thomason was a former Chair of Industrial Relations in Cardiff University and was very interested in the work of Muintir na Tíre in the 1960s. 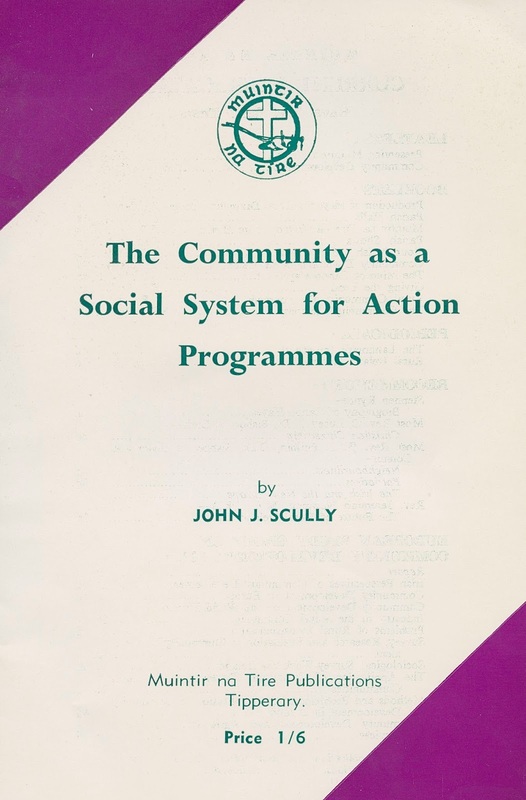 The Community as a Social System for Action Programmes by John J Scully discusses how information regarding new farming techniques and methods of operation might be disseminated to the everyday farmers in the shortest possible time. 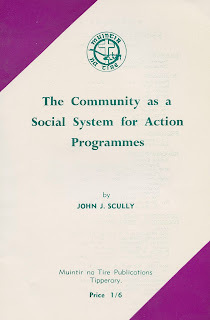 Scully as working in the Department of Agriculture in 1963 when this booklet was published. 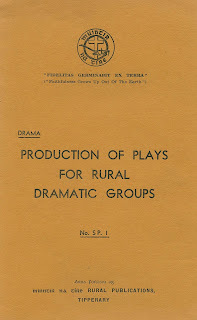 Booklets such as Production of Plays for Rural Dramatic Groups provided advice to guilds on how to select a play, produce a play, and stage a play, on acting and on costumes and make-up. 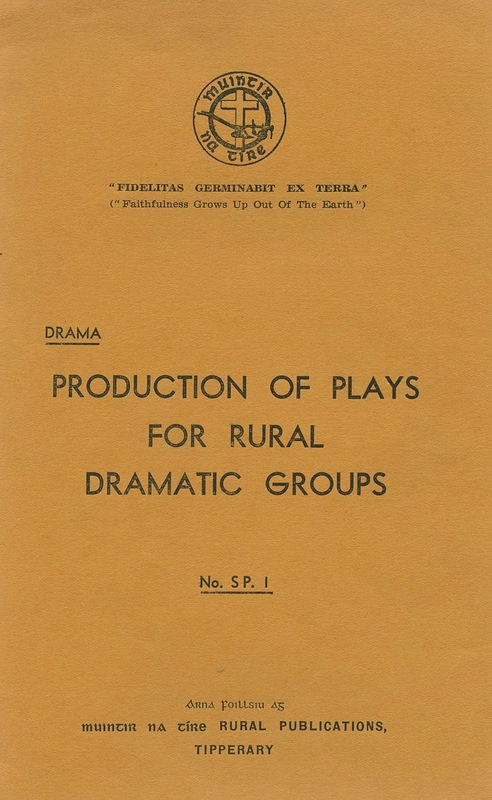 Guilds were very active in the Amateur Theatre Movement in Ireland and this booklet would have helped in improving the drama group’s productions. 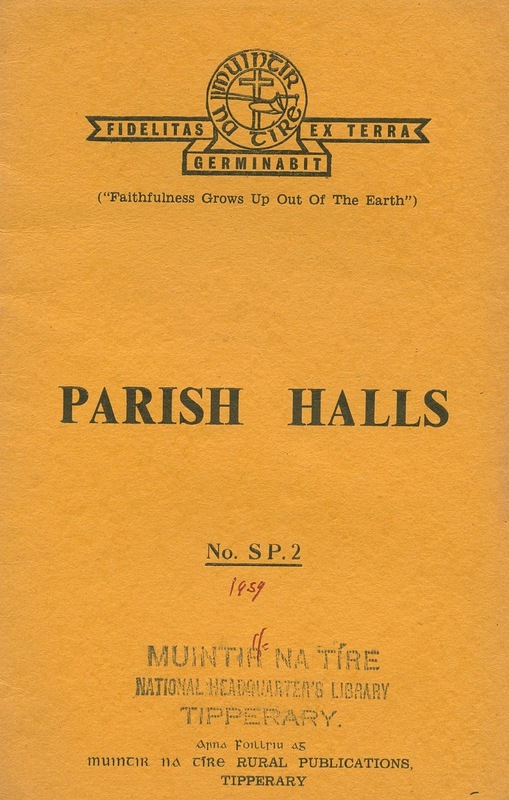 The Parish Halls booklet focuses on the use of parish halls in the rural community and gives advice on Trusteeship, Insurance, grants available and entertainment tax. 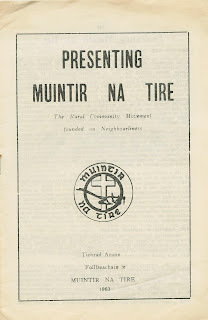 Muintir na Tíre also published booklets relating to itself and the running of guilds or community councils. 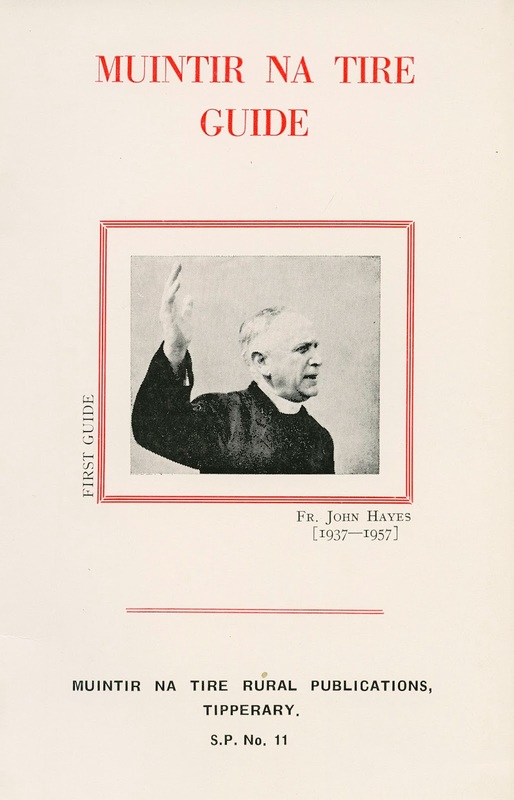 One of these Muintir na Tíre Guide provides information on the structure of Muintir na Tíre parish guilds and councils, county and provincial structures and notes for parish councils and officers. It provides guidance on how the various entities should run. 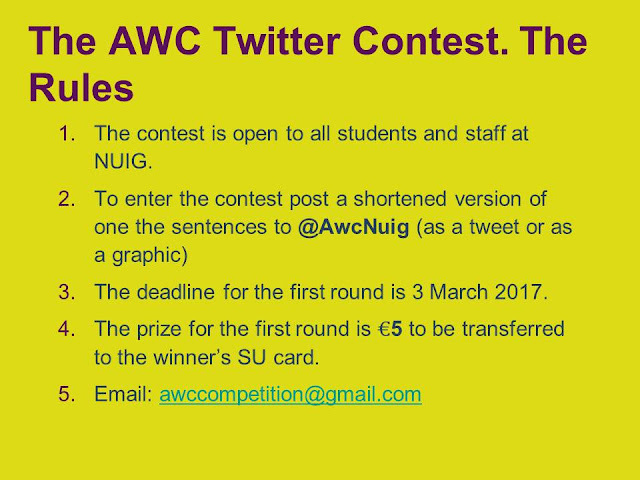 They also used their publications for promotion of Muintir na Tíre as a movement and organisation. An example is Presenting Muintir na Tíre which provides information on Muintir na Tíre with a focus on the community and the social value of neighbourliness that they endorsed. These are just some samples of the publications that Muintir na Tíre produced. These and many more will be available for consultation once the collection has been arranged and catalogued. 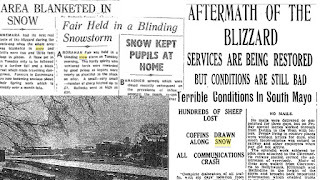 Did you know that today, 24 February, is the 70th anniversary of one of Ireland's landmark meteorological events? Following several weeks of extreme frost a series of very heavy snowfalls began on Monday 24 February and continued intermittently for several weeks into March. The effects of the extreme weather remain indelibly imprinted on the minds of those who lived through it. As this selection of images from local West of Ireland newspaper reports indicates, the weather caused severe disruption to all areas of life. 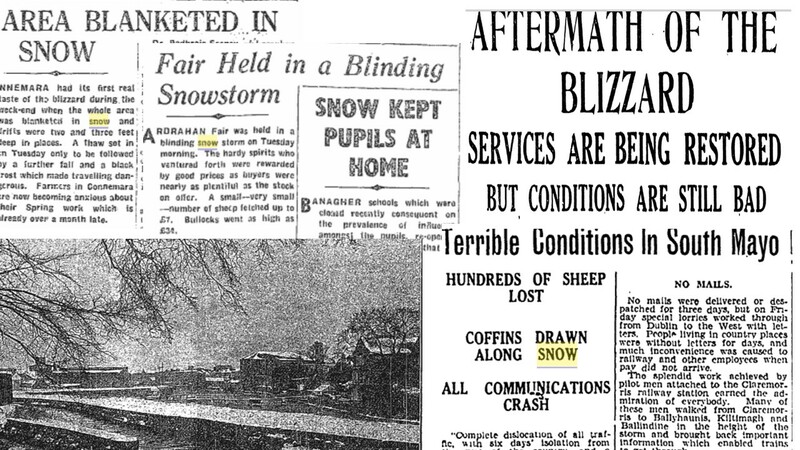 To read contemporary newspaper accounts of the "Big Snow" find the links to the Irish Newspaper Archive and the Irish Times Archive on the Library Catalogue. The images are from reports in the Connacht Tribune, Tuam Herald and Western People newspapers but newspapers from all around Ireland are represented in the Irish Newspaper Archive. Learn How to Craft a Successful Presentation, an AWC Workshop on 21 February at 6pm. If you have trouble putting thoughts to paper and words to life, join us on 21st February. We will cover crafting a presentation from beginning to end and show you interactive ways to iterate your ideas in a clear and cohesive manner, from writing to public speaking. Note: State Papers Online is not included but it can be searched via the library catalogue. 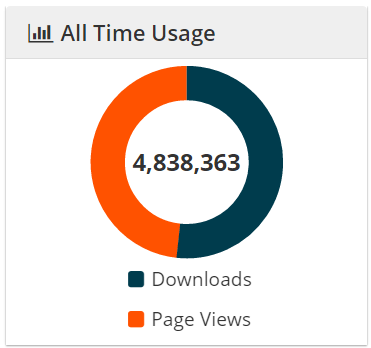 ARAN has attracted nearly five million hits (downloads and page views) to date. This data excludes hits generated by bots. A wealth of such data is now available on ARAN since the addition of a content and usage analysis module. Statistical information for the publications that you’ve uploaded to ARAN is now available from the Statistics window on the ARAN homepage. To find out which of your publications on ARAN are most popular or how often they’ve been downloaded click on the orange ‘Show Statistical Information’ tab at the bottom of the publication's page or under Usage click on view details. Most popular items and authors for Colleges, Schools and Research Centres are easy to obtain. If you want to know where readers of your publications come from consult the Statistics by country. CAIRN provides the French language equivalent of Project Muse and includes journals from 130 publishing houses like Presses Universitaires de France (PUF), Armand Colin, Lavoisier, Gallimard, Le Seuil, La Documentation française, Vrin, Le Cerf, EHESS, Les Belles Lettres, L’Harmattan, and others. Published in 2016 by the Royal Irish Academy, Art and Architecture of Ireland is an authoritative account of Ireland's artistic and architectural heritage, from the early Middle Ages to the end of the 20th century. It combines historical documentation, essays from more than 250 experts, and 2,500 images. This work is available for consultation at 709.415 ART in Humanities and Social Sciences Reference on Floor 1 of the Library. Alternatively, the e-book of Art and Architecture of Ireland (including a short video introduction) can be accessed exclusively via JSTOR.